Banff National Park, Banff, Alberta. Attracting over 4.5 million visitors annually, Banff National Park is a nature-lover's paradise. Visitors interested in mountaineering, skiing, cycling, hiking, fishing canoeing, kayaking and even photography will find more than ample space for a solitary experience in one of the world's natural wonders. Majestic mountain peaks, hoodoos, hot springs, great valleys, dense forests, alpine meadows, glacial gem lakes and spectacular rivers are just some of the natural splendor that fills this 6641 square km (2564 square mile) park. Lake Louise is one of the park's most popular spots. Follow trails to Mt. Victoria's glacial viewpoints, enjoy skiing in the winter or canoeing in the summer. The park lies in the heart of the Rocky Mountains on the BC/Alberta border. The Trans Canada Highway #1 runs through the park. 1. Tunnel Mountain Trailer Court has 320 sites and is located 2.5 km (1.6 miles) from Banff. 2. Tunnel Mountain Village I has 620 sites and is located 2.5 km (1.6 miles) from Banff. 3. Tunnel Mountain Village II has 188 sites and 35 walk-in sites and is located 3 km (1.9 miles) from Banff. 4. Two Jack Main has 381 sites and is located 13 km (8 miles) east of Banff. 5. Two Jack Lakeside has 77 sites and is located 12 km (7.5 miles) east of Banff. 6. Johnston Canyon has 132 sites and is located 26 km (16 miles) west of Banff. 7. Castle Mountain has 43 sites and is located 2 km (1.25 miles) north of Castle Junction. 8. Protection Mountain has 89 sites and is located 11 km (6.8 miles) west of Castle Junction. 9. Lake Louise I has 189 sites and is located in the village of Lake Louise. 10. Lake Louise II has 216 tent sites and is located in the village of Lake Louise. 11. Mosquito Creek has 32 sites and is located at km 23 of the Icefields Parkway. 12. Waterfowl Lake has 116 sites and is located at km 56 on the Icefields Parkway. 13. Rampart Creek has 50 sites and is located at km 88 on the Icefield Parkway. 1. Lake Louise Overflow, located 6 km (3.7 miles) east of Lake Louise. 2. Silverhorn, located 48 km (30 miles) north of Lake Louise via the Icefields Parkway. 3. The Cascade Overflow Area, located outside Banff on the road to Two Jack Main Campground. An extensive trail system leads the visitor to various scenic viewpoints and attractions. Maps and guides are available at the visitor centres in Banff and Lake Louise. A self-guided trail leads to the Bankhead ghost town. 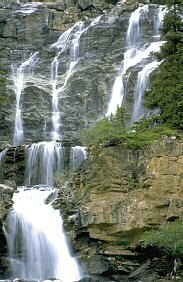 The trail through Johnston Canyon will take the visitor to a series of waterfalls in the steep canyon. Lakes such as Moraine, Bow, Peyto and Hector Lakes are well worth a visit.